– Slice the ciabatta on the diagonal into slices about 1.5cm thick and rub a split garlic clove all over. – Brush with olive oil on both sides. – Place on a health grill or very hot griddle or even under the grill. – Chop the tomatoes, mozzerella and red onion into small chunks and mix together. – Crush one garlic clove into the mix and combine thoroughly. – When the bread slices are thoroughly toasted and crisp place on a plate and spoon a tablespoon of the mixture on to the top. An excellent low fat burger option. Delicious and nutritious! – Mix together all of the ingredients in a large bowl using your hand. Make sure all the ingredients are thoroughly combined. – Divide the mixture into four and shape into patties by slapping the mixture between your hands to remove the air, then shaping it into round burgers. – Place the burgers on a plate and cover then leave to chill in the fridge for at least 30 minutes. – Cook under the grill or on a bbq for 10 minutes, or until cooked through. 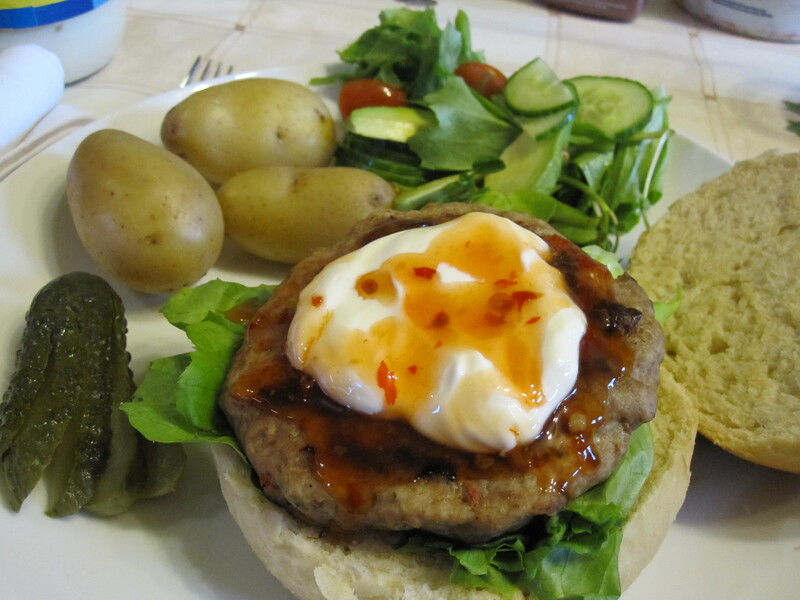 – Serve on buns with lettuce, Red Onion and Tomato Salsa and creme fraiche. – Combine all of the ingredients in a small bowl, mix thoroughly and leave at room temperature for at least 30 minutes. – Fry the onion in a little oil in a large, ovenproof pan until softened. – Add the rice and fry for 1 minute. – Add the wine an stir until absorbed. – Add the tomatoes, peppers and 400ml of the stock. – Cover and bake for 40 minutes in the oven. – Take out of the oven and stir in the parsley. Serve with grated parmesan and creme fraiche. For a more varied dish add other vegetables like mushrooms or meat like cooked chicken or smoked sausage. It’s a great throw it all in one pan dish and you can add just about anything you like to it.